After many year of not seeing each other we decided to vacation together with our wives this past summer in Ravello, Italy. The old black and white picture is us on the SCV bus back in 1972. On the left is Mike who marched 1969-1974 and on the right is Jesse Amador who marched 1966-1972. 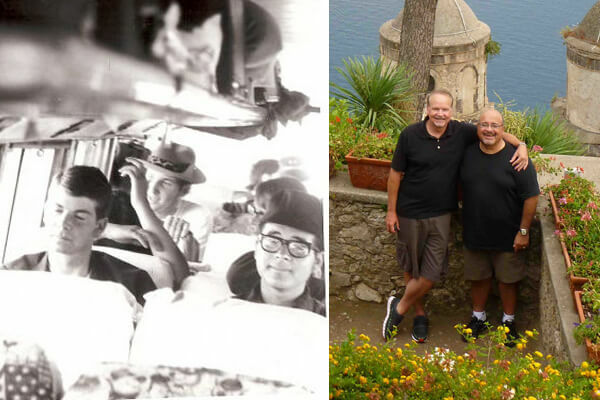 We met back up in Ravello to get back in touch and talk about old times. Mike has the rare distinction of having won an American Legion Championship (1970), a VFW Championship (1971) and two DCI Championships (1973, 1974) all with the Santa Clara Vanguard.